So many times, I will be writing about something and I will mention a past post in that post, hoping to help my readers as well as increase my page views (in turn, hoping to have new followers to inspire, help, etc…) I never use the words CLICK HERE when adding a link because those words are not SEO friendly. The more that when you use the words from your post, with a link, it puts you higher in the rank. You read about why it is important to have links back to your page, well this is equally important, because you are doing the same thing when you link to other posts. SO, example: If you wrote about a Fun Free activities for kids, you would want to write out those words and then link to it, using those keywords (like I just did). Now, when google sees my words with a link to my Fun Free activities for kids, it is going to say “OK- when someone searches Fun Free activities for kids, I will show them this page because it has a lot of links back to it”. BUT…. If you write these words… “for my Fun Free Activities for Kids, click here“ you are not linking to your focus words. Now instead of highlighting the words that you want to be found, you are highlighting the word HERE. You are not doing your blog any justice by doing this. To make it easier, sometimes I will write: CLICK HERE: fun free activities for kids. 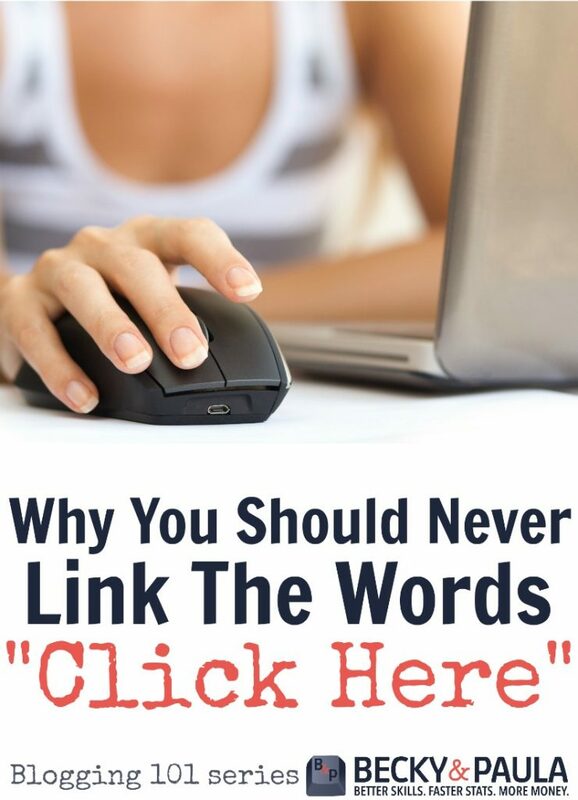 This way they know to click on the link that follows the word here, but it is just as easy for them and gives me the SEO benefits because I am highlighting my focus words (usually the same as the title of the post). I hope that was helpful! These little tips in our Blogging 101 series will hopefully help you to have even more blogging traffic! Ps- Did you see why I never put an image first? That makes so much sense. It always sounded awkward to me to use “click here”, but I couldn’t put a reason to it before. Thanks! This is a very helpful tip! Thanks! I am wondering – is there a rule of thumb for the number of times you link back to the same post? if I mention a post and link it more than once, is there such a thing as too many times? Should I add in the link every single time that keyword is mentioned? or the first and last time? Did you also know how fantastic your site is? I am sure you know. I love it! Thanks for the helpful (quick – because time is never my friend) posts! Awesome tip…I look forward to your most informative posts in my Inbox. This one did not disappoint – thanks! I love this Blogging 101 series. Every time I learn something new. Thank you for the tips! This isn’t always true. Google does and will penalize you if you focus too much on keyword (I have to wonder where this specific post will fall). Matt Cutts has even gone on record about how people do naturally use text such as click here. So I think it’s important to use “focus words” when it fits naturally, but sometimes it just doesn’t. I do think the combination of using “Click here” and the keywords is probably the best combination. How did I not already know this! Thanks for the tip!! I try not to do it often but it was more for aesthetic reasons. Now I know not to do it at all. Thanks for the great tip!